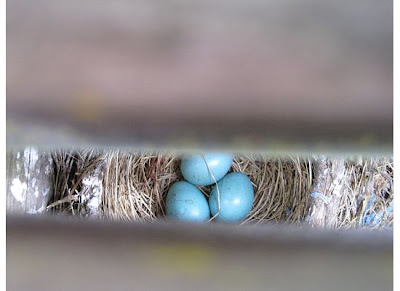 Early in the spring, I noticed that a robin had built a nest on the underside of our backyard deck. 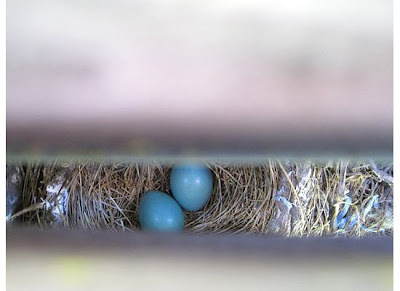 It was a messy little nest, but the cool thing was that when she laid eggs and the babies hatched, we could watch them through a crack in the deck. My kids had so much fun watching them change each day. When they finally grew up and flew away, we were kinda sad. ...appearing in the nest. The first two arrived on June 19. The third, a day later. 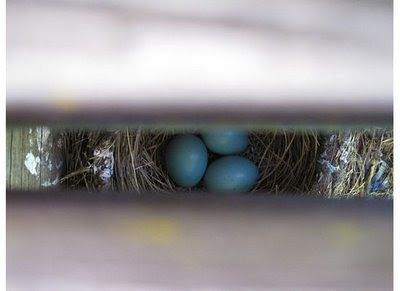 I decided to snap a picture of the eggs and resultant babies every day so I could share them with you and watch them grow on my blog. They pretty much looked the same every day. One day my daughter decided to "feed" the eggs some dry pasta, and dropped several noodles into the nest before I noticed and told her we can't go dropping stuff in the nests. Apparently the mother bird did not like the pasta, because it was gone the next morning. I don't think she ate it. Days and days went by and I kept taking pictures. (Imagine nine more pictures of 3 eggs here). 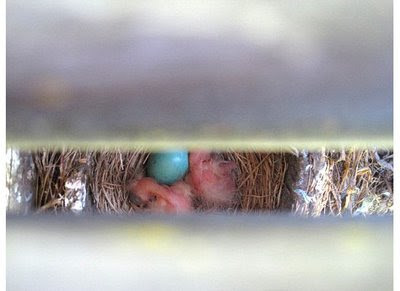 I'll add a picture of the robin babies each day, so we can watch them grow together. Ya know, we are kind of like those eggs. They looked the same, day after day. Didn't seem like much was going on. And then BAM! Something totally new emerged. I'm hatching, and growing feathers, and getting ready to fly! Watch me. blue is my fav color, and birds are my favorite animal. new life! precious..
How nifty! Thanks for sharing. Is there anything that *isn't* kinda ugly when it's first born? So I was already totally loving the egg and bird pictures, and then I get to the last two paragraphs: brilliant! Makes for a very inspiring and powerful analogy! These babies are adorable already. And a perfect metaphor for changing and growing - or shrinking! Great analogy, and great pictures! Great pics. 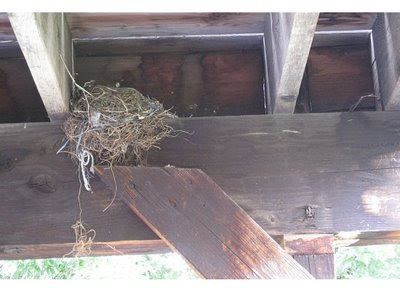 This is the second year in a row we've had a robin's nest at our camp. The robin built it right on top of our porch light that we can see from the kitchen window. It's fun watching those pretty eggs turn to ugly hatchlings and then turn into pretty birds that fly away. Great post, that's coo you did that, what a great memory. Are you aware of how amazing YOU are? You are making beautiful memories for your children. 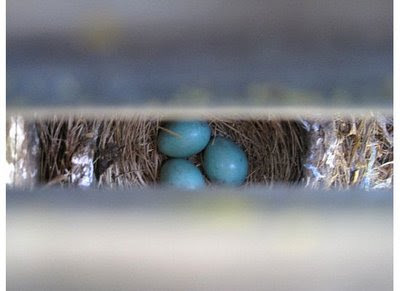 our robins do at least two nesting also (if they like the nest location) and this same momma robin might be back in the same nest next year (if you leave it alone). How gorgeous those eggs are! That color blue is amazing. And what a fascinating thing for your kids to watch. these are wonderful pics of the little fellas, ty! ya, where is the pic of you---it's time!! What a cool series of posts - I'm really looking forward to following along as they grow up. Neat! Nature is great and has so much to tell us about ourselves. And I am not yolking around! Love watching babies grow! Several years ago, my kids and I went to my sister's when she was due with her 2nd baby. 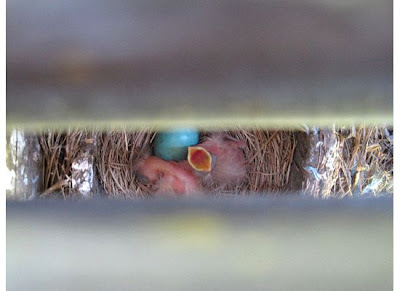 The day we got there, baby birds hatched. The day we left, they flew out of the nest. It was such a cool process to watch and enjoy. Awesome! I love to bird watch. And I love how you put that we are all growing and changing...preparing to fly!